This year our favorite workwear and “beat the hell out of” clothing got even better, because it’s now available in camo. Carhartt has always been a staple of people who work the trades and love the outdoors and it’s also become extremely stylish. Carhartt has a line of clothing now available in Realtree Camo and we are sure that it’ll be some of the toughest hunter-wear in the woods. You can go right from chopping wood to bow hunting in your new camo Carhartt jacket. Check out your next stylish street jacket or camo workwear right here on Carhartt’s website. 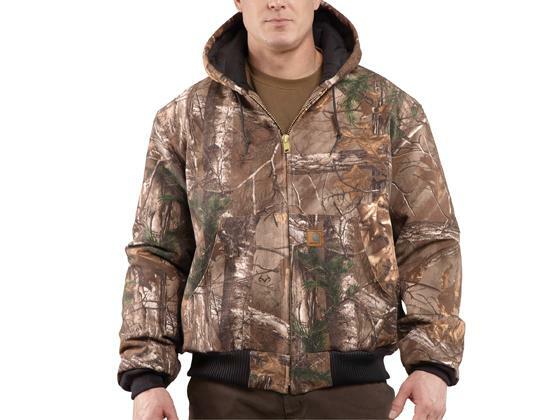 This Camo Carhartt Jacket with Realtree Xtra can stand up to all the abuse you put it through at work and in the woods. Carhartt’s line of clothing has endured years of abuse and can stand up to just about anything that you can hit it with. I personally own some of their clothes and they last a lifetime. Don’t miss out on this made in the USA Camo Carhartt Jacket.